Mr. Det is now 13 years old and being cared for by his 2 older brothers. After the death of his mother, Mr. Det and his 3 siblings had no place to go. Their 79 yrs. old grandfather took them in however unable to provide the appropriate care as he was elderly and not in good conditioned himself so therefore his older brothers became his “parents”. Being in such poverty, they are caring for Mr. Det and their little brother the best they can. 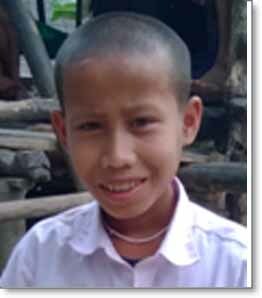 Because of EDF-Lao, Mr. Det has been able to focus on his studies and has proved to be a very capable young boy. He attends school regularly and does very well in all the subjects. 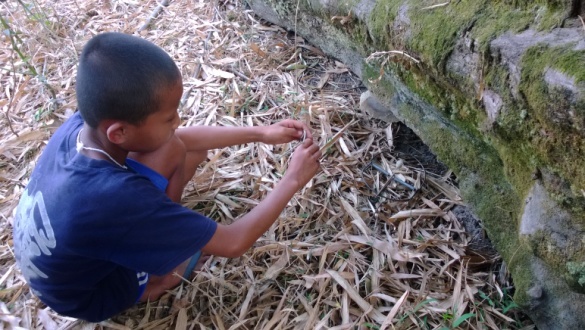 Recently his head teacher gave the following comments on his school report:The two older brothers both completed primary school however no further schooling; Motherless and fatherless, the two older brothers had to find ways to care for their younger siblings. They sold fruits and vegetables at the market however this is not a steady and consistent income. Mr. Det also does what he can to help his family such as hunting for mices out in the woods to either sell or eat at home.